Hand-painted ceramic tiles, custom tiles and reproduction. Our Ceramic Studio is located in Echo Park, California. Moroccan Style Tiles, Modern Tiles, Spanish Tiles and More. Installations, here, there and everywhere! At Ceramic Concepts, we offer a full range of hand-painted ceramic tiles, tile design services and an extensive recommendation list if needed. We work with interior designers, architects, contractors and tile stores as well as directly with the customers. Please feel free to look around; we also have an online portfolio with some pictures of installations that can be emailed to you just contact us. Ceramic Concepts has been in business since the late ’80s and has made tiles for people in all walks of like. 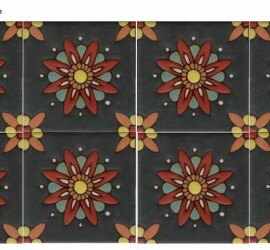 Primarily, we are makers of handmade custom ceramic tiles (hand-painted ceramic tiles); we do, though, carry a variety of our most commonly ordered styles in our “In Stock” Collection which is easily and quickly made and shipped out according to quantity. We specialize in reproductions from the ’20s and ’30s these include Craftsman / Malibu tiles, Moroccan tiles or Moorish tiles, Spanish tiles and Arabesque tiles as well as Modernist. Color matching glazes and design services are available for custom handmade tiles, or if you just want to recolor our existing patterns in your color schemes. Basically, you use our existing designs, make a reproduction or design your own tiles. We usually require around 4-6 weeks turn-around time schedule permitting. Please contact us in regards to this as our scheduling times can vary greatly. We are always working on different applications some of which include murals, fountains, backsplashes, fireplaces, floor tiles inserts, pool tiles and kitchen counters deco tiles, field tiles or subway tiles and, of course, wall tiles. Whether you need that special custom designed tile, reproduction or hand-glazed field tiles we have a great variety of styles and glaze types that you can pick from. As a studio ceramicist, at Ceramic Concepts, you will work directly with the artist/owner Felix Schmeing. We take pride in our skill, customer’s service and our honest approach for the benefit of our customer.